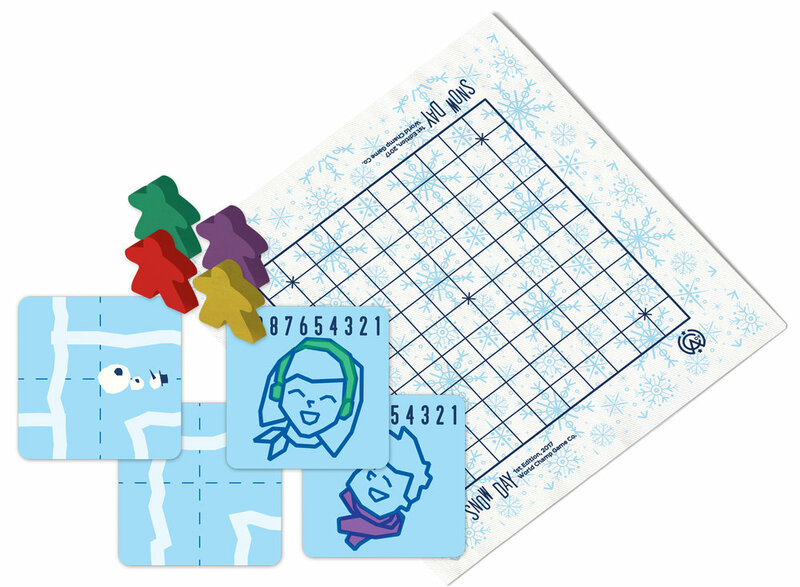 Snow Day is a board game race for 2-4 players to make it home before they freeze! Using cards to carve paths in the snow and throw snowballs, players take turns progressing towards their home base and preventing the others from doing the same, all the while staving off the wintery cold. It's every person for themselves in this fast-paced game full of strategy, cunning, and sabotage. 2-4 players, ~15 minutes. Easy to learn. Released Feb 21, 2017. Available in our store. 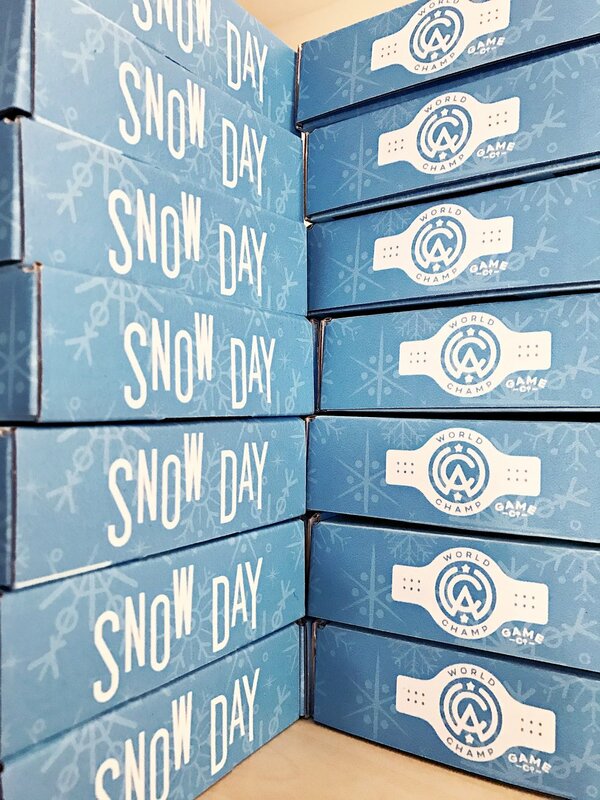 View Snow Day on BoardGameGeek . 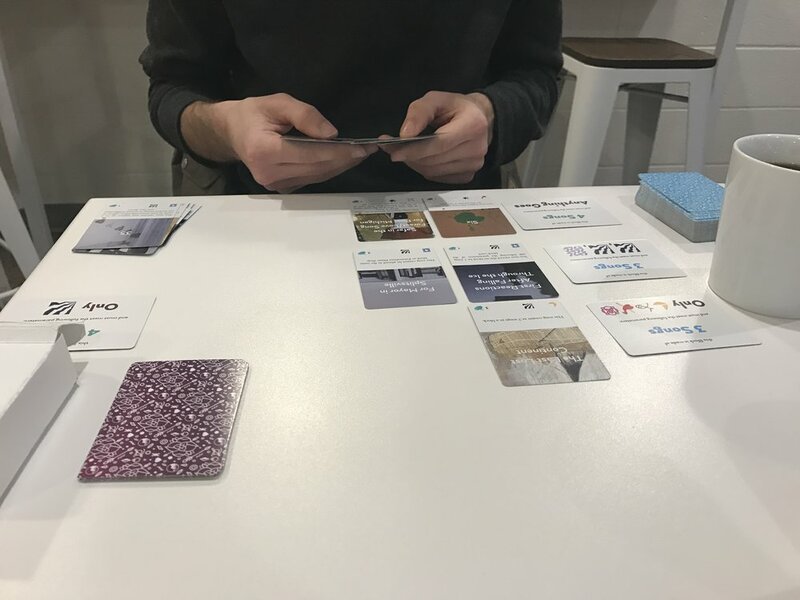 In game terms, PYB is a competitive card game, using hand management, tableau building, and take that elements for a fast and fierce playing experience for up to five players. Card suits are integrated with the songs from Mush's Protect Your Brand EP to which this game is a companion piece. 2-5 Players. ~20 minutes. Easy to learn, fast playing. Released July 28, 2017 in collaboration with Skeletal Lightning. Available at mushisaband.bandcamp.com. View Protect Your Brand on BoardGameGeek. 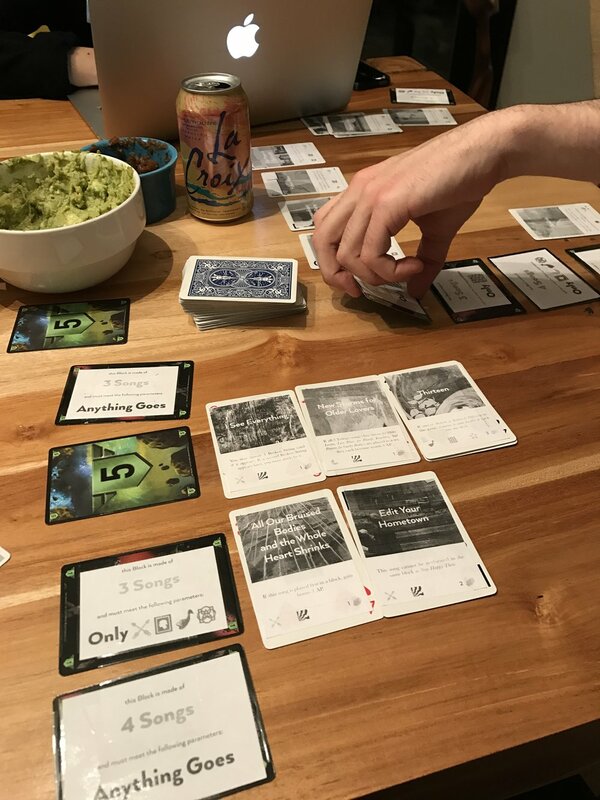 Carder Harmonies is a 1-2 player card game from La Dispute. Using song cards, you'll build set lists of varied length, trying to get the most applause points possible. Broken strings and Technical Difficulties may derail your plans, but you can push your luck searching for that perfect song to finish your set. Utilizing hand management, luck pushing, and set collection, Carder Harmonies is perfect for any tabletop gamer or LD fan! Now in the 2nd Edition, support for up to 3 players. Also new in the update are Block Modifiers, another type of card to add additional restrictions to your Blocks, either granting you bonus Applause at the game's end or costing you points upon failure. LD Subscribers have access to an update pack to bring your 1st edition game to the 2nd, also including 6 exclusive new Song cards. 1-2 players. ~10-20 minutes. Exclusive to LD Subscription Series Feb 2017. Second Edition available now via La Dispute. View Carder Harmonies on BoardGameGeek. Tat's All Folks! is a 2 player worker placement micro-game based on American traditional tattoo artwork. The two players are rival tattooers in a shop, filling in available spots with their signature piece to gain more clients than the other and become known as the best. TAF was built for economy, both space and price. The modular game board is made of 6 double sided cards, creating 64 possible board permutations. 2 of the cards function as score trackers, sliding along the numerical track created by the remaining 4 cards on the board. A 7th card contains all the rules for gameplay, while a final 8th card can be cut up and used as game pieces. The entire game could easily fit in your wallet! Following standard worker placement rules, the two players will alternate placing their 3 game pieces on the board to perform listed actions and gain/lose clients over the course of multiple rounds, with the first player to reach 9 clients being the winner. Each player also has a single use special move, called the Dead Man's Switch, that when activated grants them another immediate turn, which can make or break a player's strategy. 2 players, ~10 minutes. Super portable. Release May 6, 2017. Free Print & Play files coming soon. Remaining physical copies will be available in our store. "Critical!" 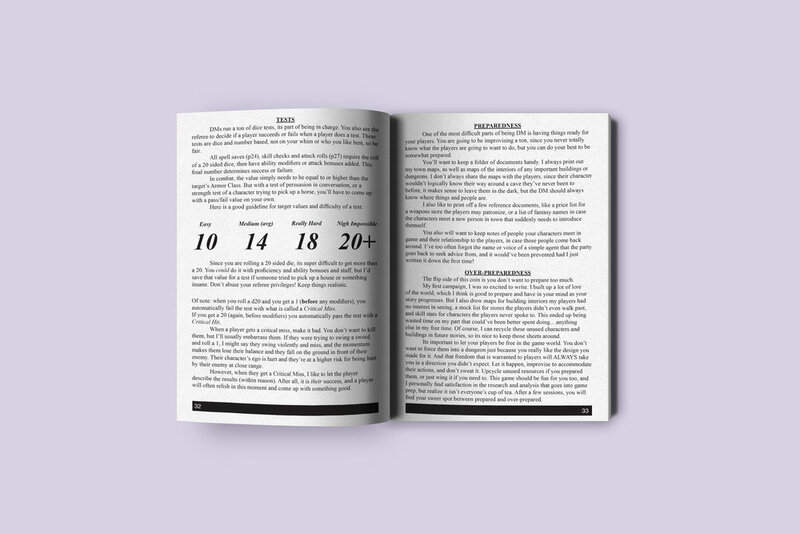 is a guidebook designed for first time players and dungeon masters to get started with playing D&D Fifth Edition; mixed with lamentations for the author's early RPG experiences, characters, and campaigns. 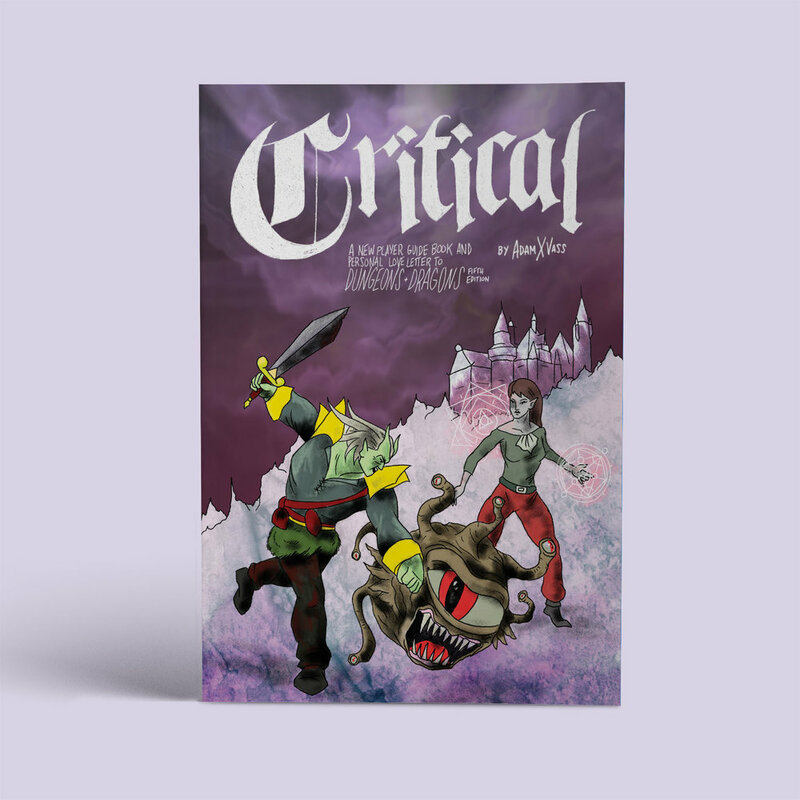 It includes a walkthrough for first time character creation, resources for budding game masters, and an easy to learn playable campaign module. Available now from Amazon and adamxvass.storenvy.com.